Being a Voice for the Voiceless. Standing Up for the Persecuted. She took her listeners on a journey to three different conflict zones where she witnessed first hand the people affected by horrific tragedies carried out under the radar from most of the world. These tragedies included the destruction of churches and mass persecution of Christians. She has clearly been impacted by the powerful stories of suffering of brave men and women. In a different conflict zone, The Baroness met a leader, who said, “Thank you. You have come to us [and just like Doubting Thomas], you have put your hands into the wounds of our suffering. Now you believe; go and tell.” The purpose of her travels is always to learn so that she can help to educate others, including those in the British Parliament about the plight of the voiceless. Turning to her home country of Britain, The Baroness spoke of the suffering of some Muslim women. She has tabled several private Members’ bills to the British House of Lords that she hopes would provide some protection for them. The Baroness Cox concluded by emphasizing that we live in countries where we have the freedom to stand up for those with no voice and that we must not take this valuable freedom for granted. Baroness (Caroline) Cox was created a Life Peer in 1982 and was a deputy speaker of the House of Lords from 1985 to 2005. She was Founder Chancellor of Bournemouth University; Chancellor of Liverpool Hope University from 2006-2013 and is an Hon. Vice President of the Royal College of Nursing. She was a founder Trustee of MERLIN (Medical Emergency Relief International) and is Founder and President of HART (Humanitarian Aid Relief Trust). 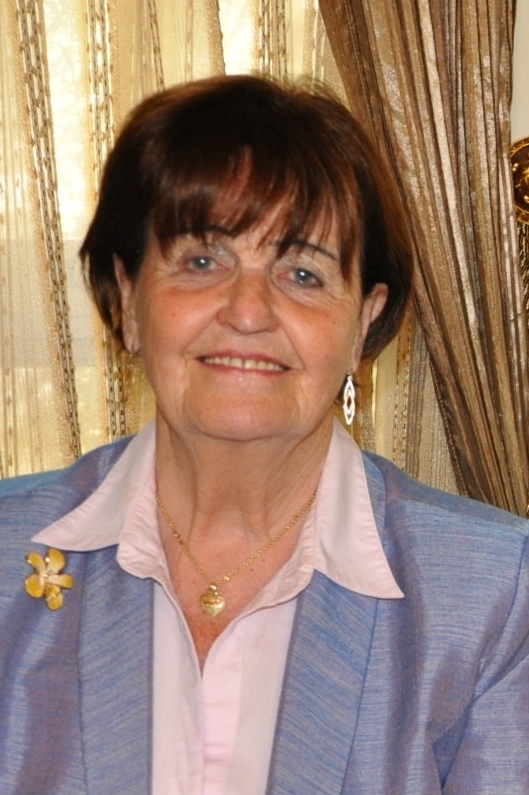 Caroline Cox has been honoured with the Commander’s Cross of the Order of Merit of the Republic of Poland; the Wilberforce Award; the International Mother Teresa Award from the All India Christian Council; the Mkhitar Gosh Medal conferred by the President of the Republic of Armenia; and the anniversary medal presented by Lech Walesa. She has been awarded an Honorary Fellowship of the Royal College of Surgeons of England and Honorary Doctorates by universities in the United Kingdom, the United States of America, the Russian Federation and Armenia. Her humanitarian work takes her to conflict and post-conflict zones, which has included the Armenian enclave of Nagorno Karabakh, Sudan, South Sudan, Nigeria, Uganda, the Shan and Chin peoples of Burma. Previously, she visited communities suffering from conflict in Indonesia, helping to establish the International Islamic Christian Organisation for Reconciliation and Reconstruction (IICORR) with late former President Abdurrhaman Wahid. She has visited North Korea to promote Parliamentary initiatives and medical programmes. Recent publications include Cox’s Book of Modern Saints and Martyrs, with Catherine Butcher; This Immoral Trade: Slavery in the 21st Century, with John Marks; and The Very Stones Cry Out, The Persecuted Church: Pain, Passion and Praise, with Benedict Rogers. Two biographies have been published by Monarch/Lion Hudson: The Baroness Cox: Voice for the Voiceless, by Andrew Boyd and The Baroness Cox: Eyewitness to a Broken World by Lela Gilbert. Mesdames, messieurs, bonjour. Thank you all for inviting me to be here on this special occasion. I’d like to begin, if I may, by introducing myself a little more modestly. All I ever say about myself, is I am a nurse and a social scientist by intention. That’s what I thought I was doing with my life. I am a Baroness by astonishment. I can tell you it was God’s sense of humour. You become a Baroness by being appointed to the British House of Lords, like your Senate. I wasn’t into politics. I’m also very shy. And so, I got this message from Margaret Thatcher at the time, in response to my work I tried to do for academic freedom in the UK, that I had a place in the House of Lords. And I didn’t move in those circles. I was so much not in those circles, I was the first Baroness I had ever met. You wake up one morning and you find a Baroness looking at yourself in the bathroom mirror…quite a shock, you say. What a privilege, of course, to be able to speak to one of the highest levels of the British Parliament. How do I use this privilege? I think the message came very clearly. It’s a wonderful place to be a voice for those who have no voice, or who have voices and voices which are not heard. So, I tried to use the big privilege of being able to speak in the House of Lords. Now one of the ways in which I’ve tried to take forward that mission…that mandate, was to establish my own little not for profit, or charity called Humanitarian Aid Relief Trust, or HART…the blandest possible name you could use deliberately, because we try to behave in a very inconspicuous way. We try to speak for people who are suffering oppression and persecution, who are often trapped behind closed borders, or in areas which are not reached by major aid organizations. That happens, because if you have an oppressive regime that is oppressing people in its own borders and doesn’t give permission to the big aid organizations to reach those victims with aid or advocacy, they don’t go. And so, there’s victims left unreached, unhelped, unheard. So, I do spend a lot of my time crossing borders, a little bit unofficially, sometimes illegally, to be with those people who are in need of aid or advocacy. We work through local partners and they are the real heroes and heroines holding front lines of faith and freedom in some of the most challenging parts of our world today. Now, the Biblical mandate is to heal the sick, feed the hungry and speak for the oppressed. Not just the Christian hungry, or the Christian oppressed. We are available for all in need. We work, for example, in Shan State in Burma, where the Shan people are suffering in a way that hasn’t hit the headlines like the Rohingya, whose suffering is very real. But there is heavy fighting going on in Shan State. They are Buddhist. We don’t hear what is happening to them. So, we work with Shan Women’s Action Network across the border into Shan State. In Blue Nile, in Sudan, it is dominantly the Muslim people who are suffering at the hands of the Khartoum regime. And it’s our privilege to be alongside them. But most of our partners are actually Christians, because most of the people suffering persecution today are Christians. Christian persecution is at an all-time high. So, it’s a great privilege to be alongside them, with aid, with advocacy and then to come back and try to tell their story. It’s my confirmation text. I was confirmed many, many decades ago, and that was my confirmation text. I have to confess that I am often afraid, I am often dismayed. And sometimes when we’re going into war zones and very high intensity conflict zones, I’m terrified. But I have to learn to cross that frontier of fear. And we all have frontiers of fear…When you do cross that frontier of fear, you meet the most amazing people. You meet heroes and heroines of faith. And we always come back humbled and inspired, receiving more than we could ever, ever give. And we all have frontiers of fear. And they won’t necessarily be the kind of frontiers of fear which I’m going to cross. But, what I find again and again, is if you do and when you do cross that frontier of fear, you meet the most amazing people. You meet heroes and heroines of faith. And we always come back humbled and inspired, receiving more than we could ever, ever give. So, I’m going to invite you, […] just very briefly, to travel with me to three of those areas with some of our wonderful partners, which we have visited in recent times and you’ll see why we come back so humbled and inspired. In the Sudan, the Islamist [government] regime, which is responsible for the previous war against the South in the Nuba Mountains, in which two million perished, four million were displaced, tens of thousands taken into slavery. I went there 40 times in the previous war, and every month [government regime] would publish a list of areas that were open to United Nations Operations (?) in Sudan and the forbidden areas. And of course, it would carry out its military offenses in the no go areas, so no one could take aid to the victims, or tell the world what it was doing. I went 40 times to those no-go areas, all parts of South Sudan, Nuba Mountains, the Beja people in the East. And [the government] did not love me very much, because you told the world what they didn’t want the world to know. We took aid to victims they didn’t want to receive aid. So, they gave me a prison sentence for illegal entry, which I’m serving in absentia. Thank you very much […] for accepting a convict. I really do appreciate your openness. But you meet the most amazing people, but you also come across the most amazing suffering. That regime is now carrying out their genocidal policies. We hear about Darfur. We don’t hear about the Nuba Mountains and Blue Nile. Earlier this year I was in Sudan, across the border (unofficially) in the Nuba Mountains, and there the regime has been attacking its own people, bombing their villages. They’ve had to flee by hiding in caves in the mountains, caves with deadly snakes. Well I slightly regretted that the next day. They took us in a vehicle to the bottom of a rather large mountain. And I had fallen over at Juba Airport and banged my knee, and it was a two and a half hour climb up that mountain in 100 degrees. And here it’s quite cool in Ottawa today, compared to what it was like there. I wouldn’t have missed it for anything. It was so important to be there, to be alongside those people, in those caves, with deadly snakes. I met a girl who had been bitten by a cobra and survived, when most don’t. The situation there is dire. But it’s important to go and come back and say, “I’ve been, I’ve seen and this is how it really is.” And to challenge the British government, which at the moment is having a love affair with Khartoum. And the United States government is about to lift sanctions against that regime, which is still carrying out its genocidal policies against the three areas of Darfur, Blue Nile and the Nuba Mountains. Secondly, if you will come with me, to northern Nigeria. It has been my privilege to be in northern Nigeria probably 30 times. The situation in northern Nigeria in the Sharia states has been very dire for Christians, for many decades. Hundreds of churches have been destroyed, many thousands of Christians killed. With the rise of Boko Haram and the rise of terror, many Muslims have also been killed. It is a reign of terror, but [we have a] wonderful partner there… [He and his wonderful wife] have suffered so much, but they have suffered with such incredible faith and dignity. A few years back, militants went to kill [this Christian leader.] They tried to kill him and [his wife] many times before, they have just escaped. On this occasion, [he] wasn’t there. You see, they took my beloved friend’s [wife] and they did the most horrendous things to her. I won’t go into detail, as you can imagine, with broken glass and with splintered wood, and they tramped on her so much, that she was blinded temporarily. To praise God for that torture, that’s the faith, that is the incredible miracles of grace we encounter with our persecuted brothers and sisters of those front lines of faith and freedom. Then finally, for the moment because time is limited, Syria. I’ve had the privilege of visiting Syria, I was there last September. I was there in Western Aleppo, when ISIS was still in Eastern Aleppo. It was an amazing visit. It was organized for us by the Armenian community in Western Aleppo. But they invited all the different faith traditions: the other Christian traditions, and their Imams and the Mullahs, and the Yazidis. And they entertained us to an open-air banquet. They didn’t have much food; all they had, they gave. We didn’t know the sacrifice behind what they gave us. And we sat there and the bombs were falling. You see, we were just 350 meters from the ISIS front line. But throughout the dinner, they arranged for a quintet to play music. So, the music played while the bombs fell. That’s Armenia for you; that’s the spirit of living faith. The next day they had a service in the Armenian church and everyone came. The two front rows were filled with the Mullahs and the Imams, Yazidis and of course the Christians were there. They had a children’s choir which sang again while the bombs were falling. What a pointed image, you have put your hand into the wounds of our suffering. What a privilege, and we have to believe, go and tell. So, those are some of the examples which I have tried to speak in the British House of Lords. I wasn’t popular for going to Syria. The British government was furious that I went. They didn’t want us to go, because they felt we would ruin British foreign policy. I now know what British foreign policy is, and I’m afraid it’s forced regime change is the last thing anyone we met in Syria wanted. It was terrifying, bringing another Iraq, another Libya. They didn’t want it. So that’s the parliamentary arena, for being a voice for those whose voice are not heard in some of the challenging parts of the world. Just before I finish, on home front. We’ve got many issues on the home front back in the UK. And one issue I do want to share with for your prayerful concern. Freedom of religion and belief we passionately believe in. But we are having a real problem in the UK at the moment with the growth of Sharia law, Sharia councils, Sharia courts and the suffering of Muslim women from religiously sanctioned gender discrimination. That suffering is horrendous. In Sharia law, a man can just divorce a wife by saying, “I divorce you” three times, and she is left destitute, with no rights forever. And yet she’s had a legal marriage, which most have not had. Then polygamy. You know we don’t allow bigamy in Britain, but polygamy is rampant in many of those communities. One of my Muslim lady friends, they come and share their anguish with me. I weep with the Muslim ladies who tell me their stories. They say in some of their communities, Muslim men may be having up to 20 kids each, growing up in dysfunctional families, vulnerable to extremism and indeed, demography may change democracy. But it’s the suffering of the women…that’s what gets to my heart and gives me the passion. I feel that I have to speak in Parliament, because the suffragettes would be turning in their graves if they knew what was happening to Muslim women in Britain today. And also, what is happening is a threat to the fundamental principle, one law for all, that fundamental principle of democracy. We’re a country that signed Magna Carta 800 years ago. Now we now have a parallel legal system. Just two little stories of the suffering of the Muslim women and why I feel so passionate that I have to speak out on this in the British Parliament. I’m afraid that the first has a gynaecological aspect to it. Forgive me for that, but it’s the reality. Happening in Britain today. This lady, imagine, a 23-year-old being used like that. She was left destitute. And then her husband started bad mouthing her, calling her broken glass, blamed her for the divorce. So, she is discredited, ostracized in her community, both in the UK and back home in the country she came from. She has lost her children. She is destitute, desolate, suicidal. My friends, this is happening in Britain today and I just felt like I had to do something about this. I had to speak up and I had to run the risk perhaps of being called “Islamophobic.” But I think the Holy Spirit gave me an inspiration. Our government doesn’t really want to know. But I believe passionately in freedom of religion and belief. But I don’t think we can allow any rulings or institutions which are categorically incompatible with the fundamental laws, values, principles, policies of our nation. And I do. And I love them and feel that one has to speak up for them. So, these are some of the opportunities God has given me to try to use the freedom we are blessed to have in countries such as Britain and Canada. And may I just say, you have a wonderful Canadian academic, Raheel Raza. And she’s a great friend. And she has done a lot to stop the development of Sharia law here in Canada. And she has come to Britain to support our Muslim women over in Britain. I really believe passionately…that we value freedom. It’s such a precious thing. We must never take our freedom for granted. And we have to use our freedom on behalf of those who do not have their freedoms. So, so much to share, but so many challenges. But I really believe passionately, and I hope this has come across, that we value freedom. It’s such a precious thing. We must never take our freedom for granted. And we have to use our freedom on behalf of those who do not have their freedoms. So, thank you for letting me share a little bit of the pain, and the passion and the privilege of trying to make a little bit of a difference in some of the challenging parts of our world today. Whether in countries such as Sudan, Nigeria, Burma, or back in our own country, where we have a responsibility for our own citizens. Thank you so much. Disclaimer: Some details, such as names and places, have been omitted to protect those involved.